Once OneDrive for Business is installed, SharePoint document libraries are just as accessible as folders on your local hard drive. Here are three ways to open SharePoint documents without opening a browser. With OneDrive for Business installed and synched to your SharePoint libraries, the search tool in the Start menu includes documents on your SharePoint site. From any screen, click on the Start button or hit the Windows key and type in the name of a document. If properly configured, documents from SharePoint that are synched through OneDrive for Business will surface along with documents stored locally. Add a toolbar to your taskbar to view and open documents in a SharePoint document library. Hover over toolbars and click on New toolbar. 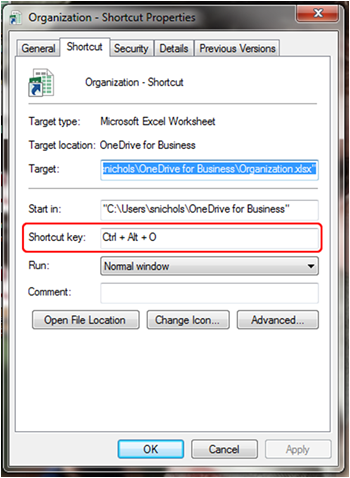 Navigate to your OneDrive for Business Folder or subfolder and click Select Folder. A new tool bar will appear on the taskbar. A bug: For some unknown reason toolbars of SharePoint document libraries don’t sort alphabetically. New documents are always added to the bottom of the list. Delete and recreate the toolbar periodically to sort the list. If you have a document that you edit several times a day and need a way to quickly open it, a custom hotkey will help. Custom hotkeys can be used regardless of what other programs or windows are open. First, create a shortcut to your document by right clicking on the document in Windows Explorer, hovering over “Send to”, and clicking “Desktop (Create a shortcut)”. Technically, this shortcut can be saved in any folder on your local hard drive, but custom hotkeys seem to work best if the shortcut is on the Desktop. Next, right click on the shortcut and go to properties. Under the Shortcut tab, there is an option for Shortcut key. Put your cursor in that field and strike any combination of keys. Try to avoid simple combinations that may be used in other software. Control + Alt + (any letter) works well. Click Ok. Regardless of what screen you’re in, you can now access that document by striking your custom hot key.